When I feel fidgety while waiting for a trade to pan out, I read trading quotes. 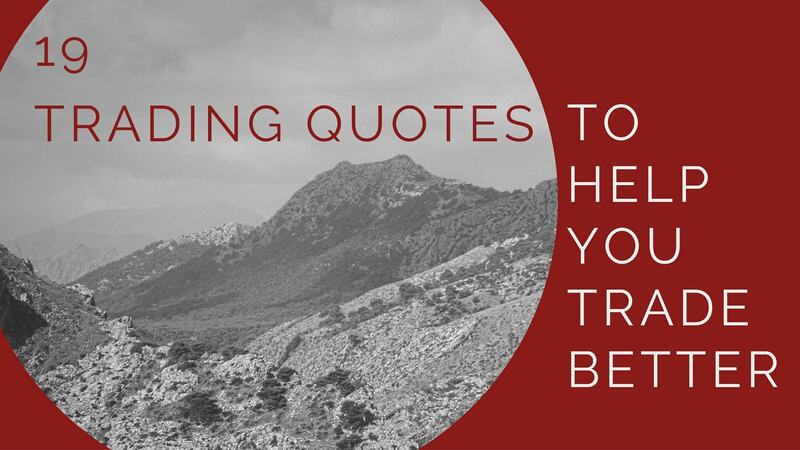 Trading quotes are short, so I can read them quickly without affecting my trading. They are also relevant and help me to keep the right trading perspective. Here, I’ve picked 19 trading quotes from 19 traders/investors. To present a wide range of ideas, I kept to one rule when building this list of quotes – one quote from one trader. This trading quote applies not just to your trading method, but your attitude towards trading. Most people are looking for ways to get rich quick and do not want to put in real effort to learn. Be different. There is no single market secret to discover, no single correct way to trade the markets. Those seeking the one true answer to the markets haven’t even gotten as far as asking the right question, let alone getting the right answer. Traders who ask think that there’s one answer. Traders who think know that they must find their own answers. Quantitative finance? Trading algorithms? Dozens of indicators? Or just plain old price action. Jack Bogle is talking about time in the context of a passive portfolio. But this trading quote applies to traders of all time frames. Always allow enough time for your trading position to prove itself. One characteristic I’ve found among successful traders is that they function effectively when they’re not trading. When markets become very quiet and range bound, they occupy themselves with a variety of activities, from sharing ideas with peers to conducting research. Traders who do not tolerate inactivity well inevitably feel the need to trade, often when there is no objective edge present. For them, losing money is less onerous than experiencing boredom. In a nutshell, good traders don’t feel that they need to trade. Raise your threshold for taking a trade. Don’t take a trade until you “see money lying in the corner”. As I’ve written at length in this article, most people have easier ways to make money. A trading philosophy is something that cannot just be transferred from one person to another; it’s something that you have to acquire yourself through time and effort. In my trading course, I’ve wrote that if you achieve trading success, you have no one to thank but yourself. If you succeed as a trader, it’s because you’ve developed your own trading philosophy. And not because you’ve adopted mine. The market does not know if you are long or short and could not care less. You are the only one emotionally involved with your position. The market is just reacting to supply and demand and if you are cheering it one way, there is always somebody else cheering it just as hard that it will go the other way. A mental state of not caring is essential for trading well. The market does not care about your position. If you care more than the market does, you cannot think like the market. Letting a loss drag on is really damaging to your mind. It shatters your confidence and makes you want to slap yourself. Take the loss and save your soul. Beginners tend to pay lip service to the importance of emotions. Only seasoned traders appreciate its importance. It usually takes time in the market and a lot of losses for this message to sink in. Don’t worry about what the markets are going to do, worry about what you are going to do in response to the markets. Control the only thing you can, and that’s you. Instead of guessing the unknown, plan your response. This trading quote is a great piece of insight for designing a price based trading strategy. This is why price action analysis lives on, in evolving forms. Once you have a trading edge, the most important thing to do is to control your risk until your profits arrive. If I have positions going against me, I get right out; if they are going for me, I keep them… Risk control is the most important thing in trading. If you have a losing position that is making you uncomfortable, the solution is very simple: Get out, because you can always get back in. You are just one commission away from getting back into the market. Don’t hesitate to get out. Limit your size in any position so that fear does not become the prevailing instinct guiding your judgment. Position sizing is important. Never trade larger than what you are capable of, both mentally and financially. If you do so, there is no way you can trade well. Getting our ego out of the way is important. Trading is a tricky profession. Common sense tells you that traders must trade and should think about how to make money. Experience will tell you that traders must not trade unless “there’s money lying in the corner”. And they should think about how not to lose money. Trading isn’t simple enough to be boiled down to a punchy quote. Well, never forget the contrarian. Share your favourite trading quote with us in the comments below! You are never trading against the markets. The only thing that can take you out of the game is yourself. It takes time and patience to figure out how you as an individual can become comfortable taking trades. I could never follow what others were doing because it never seemed natural to me. Now, I know what mistakes I will make before I make them. Therefore, by knowing what I feel comfortable with doing, I can maintain my awareness and not take trades that have a probability of performing poorly. I strongly agree with the philosophy of never trade unless there’s money around the corner..mim definitely going to incorporate this in my trading plan…., ps investing A lot of time in my research and knowledge acquisition as a trader. That’s right! Yet this is exactly what most traders have problem with. We feel that if we don’t trade, we are not traders. We end up trading even when there’s no edge. Nice quotes you have here. It truly is important that beginners learn that, your strategy is but a small factor in whether you make money. Learning how to size your positions and the amount of risk you take per trade is much more important. Thanks for the comment! I would say both are equally important for sustainable profits but most beginners neglect the risk management part.